The Appalachian Trail is known for many things: its impressive length (2,200 miles), growing popularity (thousands of people attempt to thru-hike it each year), and, of course, unrivaled beauty. In Northeast Tennessee, you’ll find some of the most stunning scenery the AT has to offer. With grassy round balds, rugged outcroppings, and wild rushing rivers, the Tennessee portion of the trail has a little bit of everything. And the best part? You can reach these fantastic landscapes by walking just a few miles from your car. If you want to sample some of the best parts of the AT, begin with the following five sections. A meandering grassy trail, dense thickets of rhododendron, and views that stretch for miles: these are just a few of the wonders awaiting in the Roan Highlands. Even the drive to get there is gorgeous, as the road windings through the mountains to the Carver’s Gap parking area. Heading northbound from the gap, you can soak up spectacular panoramic views in just under a mile as you top Round Bald, the first of three named balds in the highlands. Beyond the balds, the trail dips into spruce and fir forests, and certain times of year bring sprays of lovely wildflowers along this section of the AT. If time allows, continue from Round Bald and tackle the 5.5-mile hike to Overmountain Shelter for an 11-mile round trip. The shelter is an enormous red barn perched on a hillside overlooking a soft, scenic landscape, and many would agree it’s the AT’s best place to overnight. On a day hike, though, Overmountain makes a perfect picnic spot before your return trek. Known to some as the Grand Canyon of the Southeast, the Nolichucky River Gorge is deep, rugged, and indeed a sight to behold. As the last major free-flowing river in the region, the Nolichucky is the epitome of a roaring river, offering a wild ride for paddlers who take on its 10 miles of runnable rapids. A few sets of switchbacks will put you high enough to enjoy expansive views of the Nolichucky River Gorge and several panoramic viewpoints along the way. Your turn-around point is where the trail leaves the ridge and turns downhill, making this about a five-mile round-trip hike. The majority of the hike to 40-foot Laurel Falls is a leisurely stroll. Beginning near the sparkling waters of Watauga Lake outside of Hampton, this section of the AT rewards hikers with close-up views of 40-foot Laurel Falls. To hike to and from the falls is only five miles, and the route’s lush, verdant flora and jagged bluffs and outcroppings make it feel fresh and new at every turn. The majority of this popular AT section is a relatively gentle creekside stroll. However, anyone who has hiked this trail will be quick to mention the stairs that make up the final descent to the falls. What begins as a moderate hike gives way to a long, steep staircase, so mind your step getting down them, and remember to allow plenty of time for the climb back up. 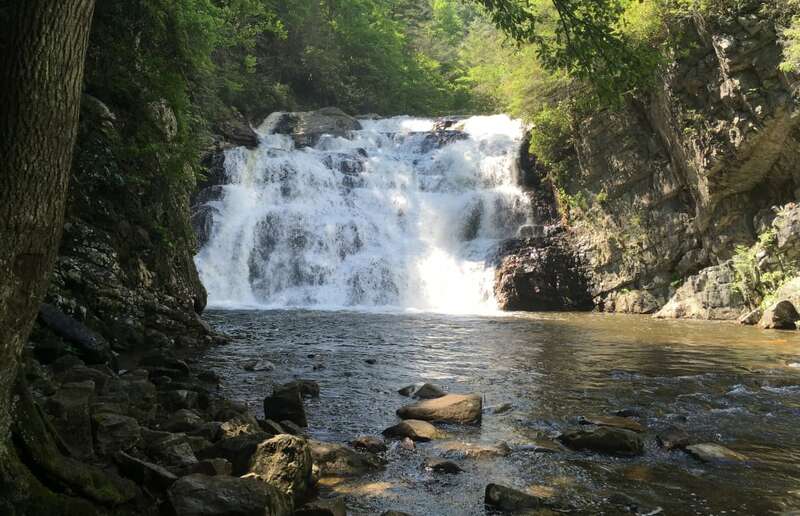 While the last part of the hike is a challenge, the beauty of Laurel Falls makes it well worth the effort. The section of the AT running from Highway 19E to Hump Mountain also explores the majesty of the Roan Highlands, but you’ll approach the highlands area from the opposite direction. While it’s possible to reach Hump Mountain from Carver’s Gap (mentioned above), it would make for an extremely long day on the trail, and that route is better suited for an overnight trip. Instead, begin your hike from the trail crossing on Highway 19E heading southbound and climb gradually for nearly three miles to catch your first views of the undulating landscape along the Tennessee/North Carolina border. After you pass through Doll Flats and scramble through a difficult rocky patch, you’ll emerge onto Houston Ridge and finally reach the summit of Hump Mountain. At an elevation of nearly 5,600 feet, the top of this bald mountain can be windy and cold, so be sure to pack layers. However, on a warm, sunny day, you can lounge on large rocks and take in the beautiful views that encircle Hump Mountain. By the time you get back to your car, you’ll have logged 10 tough miles and experienced one of the best panoramas in Northeast Tennessee. 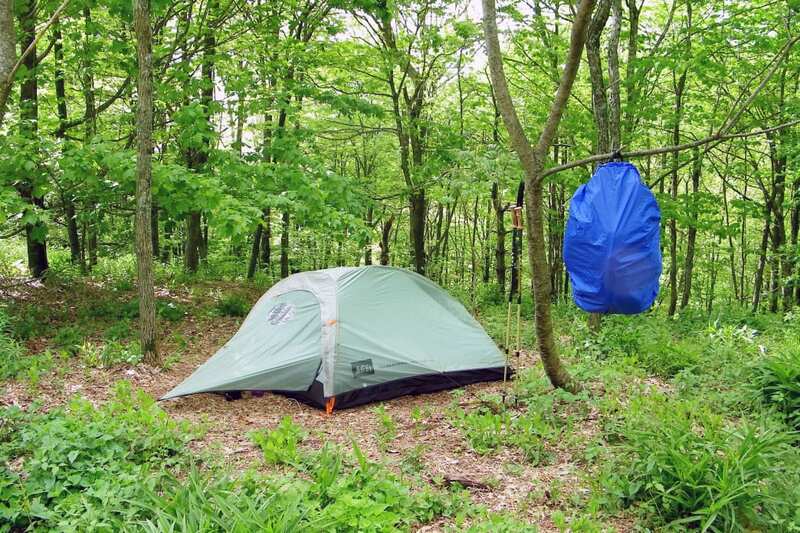 The AT between Indian Grave Gap and Beauty Spot sees light traffic, making it a great place to camp in solitude. Beginning just outside of Erwin, the hike to Beauty Spot is the shortest of the bunch at just under two miles each way. The trailhead is situated right on the border of Tennessee and North Carolina, and you’ll head north from Indian Grave Gap to reach this scenic destination. The trail to Beauty Spot, a grassy bald mountain, is fairly gradual with a few steep sections sprinkled in, just to keep things interesting. Once you reach its summit, you’ll be rewarded with 360-degree views of the Appalachian Mountains and even a glimpse of Erwin down in the valley. Hikers have the option to continue another three miles to the summit of Unaka Mountain, where you’ll encounter beautiful, dense forests but only a few scenic views. Aside from the fantastic scenery at Beauty Spot, the best part about this section of the AT is that it sees very light traffic, making it an ideal spot to escape and enjoy the spectacular mountains and wilderness of Northeast Tennessee. If you are in need for a longer break, check out the top trail towns in Northeast Tennessee. Written by Madison Eubanks for Matcha in partnership with NETTA.